NarniaWeb Community Forums • View topic - How should future films be different from the Walden movies? How should future films be different from the Walden movies? Anything you'd like to see in The Silver Chair and beyond that would be markedly different from the original Walden Trilogy? 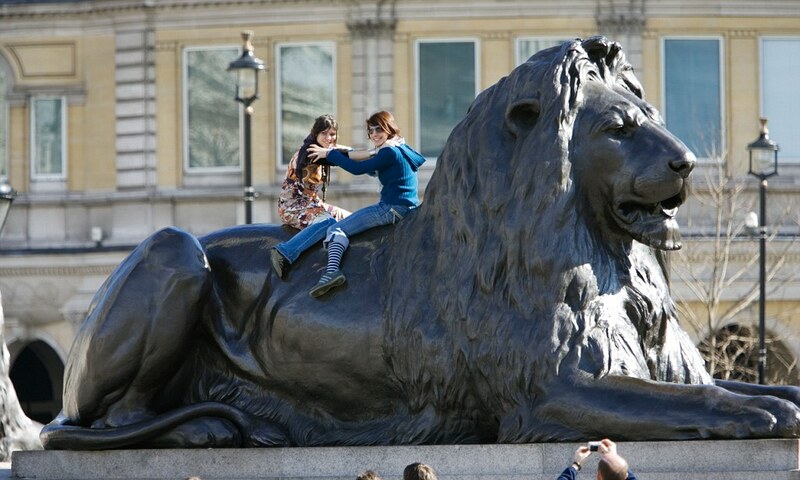 The other day, I was looking up the lions in Trafalgar Square after remembering that Lewis likened Aslan to them in SC, and I was struck by the massiveness of the stone lion in this picture. Imagine how breathtaking he would be if he were alive and awake! Now, I wouldn't want Aslan to be that big because we would heading into Clifford the Big Red Dog territory, but I think I'd definitely like to see him larger than the Walden Aslan in future films. Of course, we know from the "you will find me bigger" scene that Aslan's size isn't static, but most of the descriptions in the Chronicles have a "bigness" to them that I find lacking in the Walden portrayal. A lion in our world is a bit less than four feet tall at the shoulder, and that seems to be close to the size of Walden's Aslan. Shasta, on the other hand, describes him as taller than his horse in HHB. I think at least over five feet, which would make Aslan about shoulder-to-shoulder with a six foot man, would be more accurate and effective. More visually powerful and awe-inspiring. Not so big that he's an impersonal, earth-quaking giant, but big enough to be worthy of the title "The Great Lion". Re: How should future films be different from the Walden movies? Well, to parrot Glumpuddle, a lot less epic scenery shots. Don't get me wrong, I want there to be beautiful scenery in places like Cair Paravel, or Aslan's country, but the North should be pretty bleak and dull until the travelers get close to the mountains. And I'd like to see it more from the point of view of the characters (less helicopter shots). This would help the story feel more grounded and real. On the whole, I'd like a lot more grit and realism, but different from PC. That leaned more toward the dark and dramatic. I think Narnia in SC should feel old and tired, still beautiful, but not too glittery and fairytale like at this point. I'd also like to see Cair Paravel as a medieval castle instead of a sprawling palace. On the whole I want the world (scenery, sets, costumes, etc.) to feel like it's been there for a very long time, not just conceived and made for a movie. Things like dust in the corners, mended clothes or items, colors that have started to fade, and imperfect hair can go a long way. Have more dialogue of the main characters. Other than that just make it closer to the books! Slower pace. More emphasis on atmosphere than plot. Make Aslan intimidating, wild, and... well, not tame. In the Walden versions, he felt like a wise old grandfather. The Rose-Tree Dryad wrote: I'd definitely like to see him larger than the Walden Aslan in future films. I sometimes wonder if the filmmakers just can't win with this one. I agree he felt too small in the Walden versions (it was odd seeing Peter tower over him). But if they make him much bigger, he will feel too monstrous. But... I suppose I'd rather have him be too big than too small. It might help if the art direction was more stylized. Glumpuddle wrote: I sometimes wonder if the filmmakers just can't win with this one. I agree he felt too small in the Walden versions (it was odd seeing Peter tower over him). But if they make him much bigger, he will feel too monstrous. But... I suppose I'd rather have him be too big than too small. I found it even more distracting how they seemingly couldn't decide how Aslan should look anyway. In every movie so far he had a different design . And besides that he was made bigger in PC (and changed his line so that he "grows" bigger every year, eugh), and then smaller again in VDT. The problem of Aslan's size throws more fuel on my desire to see another animated Narnia film. I don't think Aslan's size would be as big of a challenge to crack. If you gave me $100 Million to make a Narnia movie, I'd probably hand it all to the same studio that produced The Breadwinner, Song of the Sea, and Secret of Kells. The heroes need to be characters to aspire to. I think Walden did a great job with Lucy in the first two films, Peter in LWW, and Edmund at points in PC. I get it, people have baggage, but it's HOW you handle the baggage that determines your character. On the Aslan topic, even if they made him 20% bigger than in PC, I think that would be perfect. While I get why Lewis changed his size depending on the scene, it's awkward to do that in film. Maybe in a few dramatic scenes, where it makes sense, up his size some, but only if it works well visually. Or maybe he's a little bigger in Aslan's country. Otherwise, it looks corny to have him constantly changing sizes or just to have him MASSIVE in general. I'm also an advocate for more grit. Show some more scraps, smudges on their faces, wear and tear. As beautiful as Narnia is supposed be, if it's too clean... then that will take away from the end of Last Battle where everything is meant to be perfect. Glumpuddle wrote: If you gave me $100 Million to make a Narnia movie, I'd probably hand it all to the same studio that produced The Breadwinner, Song of the Sea, and Secret of Kells. Absolutely! What beautiful work they produce! Is their art what you mean by more stylized? Or is that something you'd like to see with live-action-style CGI? Do you have any examples of more stylized CGI work in live-action films? I'm trying to visualize that - excuse me if I misunderstood you! Monty Jose I also really like your suggestion for more actual dirt and damage going on. Make it feel like a real world! Honestly I think I'd just like to see consistency - stylistically, in the character development, in tone, etc. All three of the first films were trying to do something incredibly different. I understand that your characters, your world, etc., grow and change, but many aspects of the movies just do not feel cohesive to me at all. Buds: 5, Twin Blank! <--- also don't remember who Twin Blank was. Find me if you're out there, lost one. checkers wrote: Honestly I think I'd just like to see consistency - stylistically, in the character development, in tone, etc. I hear you, yet I have to respectfully disagree on the last point. The problem is that even the books are all different in tone. I think stylistically it’s possible to keep some consistency (though that will naturally shift to some degree) and it’s possible, even necessary, to keep continuity with the character development (a major flaw in VDT, especially concerning Ed and Lu). But because the cast does change and the plots are all so different, there are going to be major differences in tone. The Magicians Nephew is going to feel nothing like The Silver Chair. It just doesn’t work in the tone. Once upon a time, that might have been a bad thing for film. But that’s one thing I think we can be grateful to Marvel for. Excuse the comparison, because I don’t want Narnia to feel anything like Marvel. But they broke the mold and accomplished making many films with different characters, wildly different tones, even different genres and styles, yet people accept it as the same world. So it’s possible to create a cohesiveness without sacrificing how unique each book is. I believe the consistency of themes and values (includes consistency in individual characters’ values, barring redemptive character development) in these worlds (Marvel and Narnia) is/could be a major factor for success, which I think Walden got wrong to some degree, especially in VDT. Having a faithful portrayal of Aslan will also be a major aid in keeping a sense consistency. This also needs to be fixed from the Walden films, especially in his appearance. He never changes, just reveals more of himself in each story. If they can sell that he is constant and steady and unchanging in his goodness and power (though he’s not a tame lion! ), that will be a huge win on the filmmakers part. I want Narnia to be its own character. It's a fantasy and we need to not only accept the world, but love it. Especially as we are having characters from our own world travel there and want to be there. I feel like we hardly got to know it in the Walden films. I know there were time constraints but because they had the kids be 'reluctant heroes' they spent so much time wishing they were gone it was hard to enjoy this magical world. What kid didn't wish there was a secret world hidden somewhere in their house or neighbourhood? I often would play pretend at that so the first time I saw the BBC version on TV (I'm old ) I was so excited because this was exactly the kind of movie I had been waiting my whole life for. I don't really care about Aslan's size. He seems to grow and shrink in size from time to time in the books too. A lot has to do with how the kids perceive him or how he chooses to show himself. What matters is establishing a world where this makes sense. If he is established as a supernatural lion vs the other talking lions in that world it would be fine. I'm not really concerned about it. I think that they are making a huge mistake in wanting to be utterly different from the Walden films. If you look at what people who are not full on Narnia Nerds like us, the general reaction to hearing that there might be more Narnia is a desire to see a sequel to the Walden films. Even if people didn't have the highest praise for Walden's Narnia films, they are seriously expecting that anything coming out now will be attached to those films. Netflix needs to really consider this. Weather anyone likes it or not, Andrew Adamson set the bar for Narnia when he made LWW and now when people think of Narnia on screen, the Walden films come to mind because the visuals are so distinct. And the cast is so memorable and brilliant. And Liam Neeson as Aslan was the best casting choice. I could go on and on. I really think that anything they try to do will fall short of what anyone really thinks they want to see. Netflix has the rights to all of the books, which means they will probably be making LWW again. Is that what anyone really wants? I don't think so. I certainly do not want LWW or PC or VotDT made again. liberty wrote: I think that they are making a huge mistake in wanting to be utterly different from the Walden films. I assume you're referencing Joe Johnston's comments? And I think Mark Gordon as well? The following is my opinion, based on the evidence of the news coming out and a few behind the scenes tidbits. I believe that everything we knew about SC up to this point has been scrapped due to funding/creative license disagreements between Mark Gordon and whatever other production company (Universal or Tristar maybe?) they were trying to get to distribute the film. I believe that whatever the disagreements were over made the creative team look around for a new distribution company and they found Netflix. I believe that when they hooked up with Netflix, part of the agreement there was "sure, we'll take you on, but only if we get to start over with all seven stories." And if that is correct, and again, I don't know for sure that it is, Joe Johnston's comments about being super different from the Walden films can be scrapped because I don't think he's involved anymore. Liberty, I totally agree with you there were many, many things the Walden films got right, but I also believe there's always room for improvement. I'm from the BBC generation, I'm one of those who actually love those productions low-budget though they are. There was a lot of stuff they got spot on in there, but I love many parts of the Walden movies too, especially LWW. I'm sure that the same will be true for the Netflix version. There will be parts I love and parts I hate. That's simply the nature of filmmaking. And so this thread is for discussing how to improve and separate from the other films so the new round can have it's own identity. Totally different does not equate to totally bad because the others were good. Liberty wrote: I really think that anything they try to do will fall short of what anyone really thinks they want to see. Netflix has the rights to all of the books, which means they will probably be making LWW again. Is that what anyone really wants? I don't think so. I think for the Walden movie generation like yourself, perhaps. But when they announced Silver Chair a couple years ago and that it was going to be a separate entity from Walden, the bulk of the comments were "Why don't they just start over again?" I would be included in that group. What I want is a full set of consistent, GOOD films from LWW (or MN if we're talking chronological) to LB. Narnia deserves that. I think the biggest thing for me is to not think of the Narnia stories as an epic fantasy series, but as a collection of fairy tales. I hope that distinction makes sense. Trying to fit Narnia into an epic fantasy mold was imo the biggest source of problems for the Walden movies as adaptations. When you think epic fantasy, there is an expectation to have battles, and frankly most of the battles in the book really aren't that important... they definitely aren't what sets the Narnia books apart as being unique. The problem was that in the Walden films the battles sparsely described in the books were swelled up to the point where they stole precious screen time from the stuff that does make Narnia unique. Examples would be taking away from Aslan restoring the statues in favour of the Battle of Beruna, taking away from the magic of winter turning into spring in favour of the melting river scene, entirely cutting the scene where Caspian confronts Governor Gumpas in favour of a more conventional approach (i.e. a battle), and most tragically for me, taking away from Aslan restoring Narnia in PC in favour of the Second Battle of Beruna. Many of the scenes in the books that were cut and/or minimized in the Walden films were some of the best stuff and if you are cutting them in favour of battles because you fear the audience might get bored, there is a fundamental problem. Those scenes are anything but boring in the books. Reepicheep775 wrote: I think the biggest thing for me is to not think of the Narnia stories as an epic fantasy series, but as a collection of fairy tales. If you approach them as just a collection of fairy tales, there is less pressure to raise the stakes and emphasize on the entire universe being threatened blah blah blah. I shall think more on this. Thanks Reep! I'm kinda wary of the word " fairy tale". If you mean it the same way Lewis meant it, then I'm with you 100%. But there is a tendency to think of fairy tales as rather silly, charming stories for small children- something I believe the BBC series was guilty of. I don't want to see a corny, weak adaptation, and I'm afraid if you asked the new filmmakers for a fairy tale, this is what you might get. Remember, Netflix is looking for more family friendly content. I think that's great, but it can be overdone. And I don't want that to happen to Narnia.